Irish wrestlers share a commonality with most other sportspeople on this island. Much like players of Gaelic football, hurling, the League of Ireland, basketball, and a chunk of those competing in athletics, it’s virtually impossible to make a living out of the sport. A day job is a prerequisite if you want to get by, the irony being it means less time dedicated to your craft, less time spent getting oneself to the level required to get to the next level make some decent money. In Ireland, it’s professional wrestling in name only. That said, when we contact the man known on the Irish wrestling scene as Billy Bedlam, it’s no surprise that he’s in the middle of a work shift. Working in sales, we figure out a time that doesn’t interfere with his job for us to talk about his new venture: Phoenix Wrestling. At 39, Bedlam was a late bloomer to the sport. His first involvement was just four years ago, with his debut coming a year later. In that time he’s done as much as he can, from announcing and refereeing to commentary and checking tickets on the door, as well as the actual in-ring stuff. It’s all been in preparation for this new venture he’s undertaking. I always kind of knew that when I stopped wrestling that I’d do something like this. It just happened a year or two before I’ll stop wrestling; the opportunity arose so we said we’d go for it. I think everybody that’s coming up in wrestling and already in wrestling, age aside -- doesn’t matter you’re 19 or 35 like when I started -- I think fundamentally to get a good understanding of the business, you need to do as many jobs as you can, you need to be relevant, and help whoever runs that company. Whether you’re asked to do commentary, refereeing, hold the door, to do Snapchat or whatever, any kind of job you can make yourself available to do as a new wrestler or trainee. And that’s what I did when I was training at Celtic Championship Wrestling, I was only in the door three weeks and I was commentating. That’s basically because I was more senior and more mature than other guys there, because my actual professional job is in sales and stuff, so I can actually present myself well from a commercial point of view. But then obviously announcing and refereeing was all to do with learning as much as I could and making myself available for the promoter to help as much as I could. Bedlam will need all of that experience moving forward, considering the ambitious project he has laid out before him. CCW was the precursor to Phoenix, but since its last show in June, the promotion has laid dormant. There was no official announcement of its end, but it is all but finished. As the new company's name suggests, it's rising from the ashes of what went before it. For Bedlam and co-founder Marian Armstrong, it gave them the perfect opportunity to make a go of it. Watch this to see our final match announcement. The timing could hardly be better. Irish wrestling is at an all-time high. There are three compatriots currently on the WWE roster. Behind them, there's an abundance of talent cropping up on the local independent scene. such as Session Moth Martina who recently completed a tour in Japan. Most importantly, the fanbase are following the talent - it's not unusual for shows to sell out these days. Despite the boom of late, some parts of the country have not felt it, and Bedlam and co want to take full advantage of that gap. What we want to do, is travel around and take over a market in Munster that nobody else is really in at the moment. Phoenix Wrestling will host its first event, F**k Sake, Not Another Wrestling Show, this Friday at The Kino in Cork, the county in which the company will be based. But the plan is to be the flag bearer for wrestling in all of Munster, bringing shows to parts of the country that have been starved of action over the years. Shows are already planned for Limerick in the near future, but for Bedlam it's not good enough to just bring the events to these places. We’re also launching in Dolan’s Warehouse, September 8th is our first show there, so to be able to use the local market in Limerick is great. We've got Steve Savage, who's our local guy there, who can introduce a little bit of Limerick culture. It's the same as we’re doing in Cork, using the local culture to enhance the wrestling show. That wasn’t done in the past, it was just a wrestling show, take it or leave it. There was never any kind of cross-cultural experience between comedy and music and the local community and whatnot, and I think that’s what we’re trying to do differently in Cork and Limerick. You’ll never know who you’ll see on our shows, we have a few different tricks up our sleeves when it comes to local guys, local comedians, musicians and sports stars that might pop in and out of Phoenix, be it in Cork or Limerick, and maybe even Waterford in time, in the next six to nine months. Billy mentions the word 'exposure' in our interview several times. It's one of the most priceless commodities for a pro-wrestler. You could be putting on some of the most incredible matches with regularity, but if no one is paying attention, you won't get very far. Guys like Ricky Combat and the aforementioned Savage, who have been stalwarts on the Cork scene, haven't gotten the national attention they deserve in his mind. Bedlam's plan is to take the local talent and put them in the ring with performers who have already gotten their due credit, giving them the opportunity to face big names while creating match-ups that no one has seen before. "We thought we could use our experience and the contacts that we have in the business, and all the Irish talent we can bring to Cork," he explains. 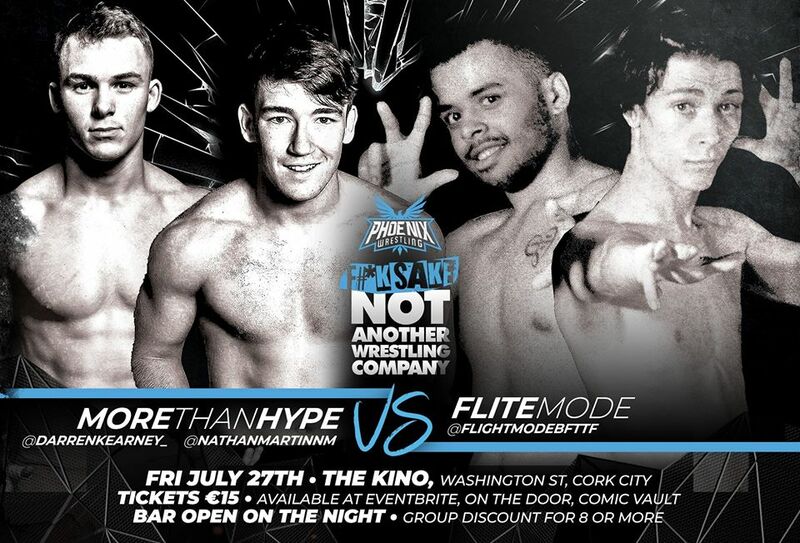 If you can believe, it’s More Than Hype’s first ever trip to Cork, which is unbelievable to think how big they are in the Irish wrestling scene and they’ve never wrestled in Cork. It’s a different feel to our wrestling show that we’re trying to produce, and definitely using the local people and community that we have in general, with guys who are over like More Than Hype. The likes of Legit 100, I know we have Michael May on the card, but certainly… if we could have everyone involved in the one card we would, but obviously with budgetary constraints you can’t. The boys also have Curtis Murray, Scotty Davis, Kings of the North, these are all boys we want to bring down who have never wrestled in Cork and we want to get them involved with us as well. There is a distinct lack of animosity between the various promotions in Ireland these days, which wasn't always the case in the past. That could be down to geographical reasons. Over The Top Wrestling, which has made the biggest impact on the scene in general, have for the most part based their shows in Dublin. Uprising have also put together some great shows, but are based in the North, while there is very little out in the west. But there has also been a realisation in the past five or so years that what's good for the goose is good for the gander. "Everybody that’s involved in wrestling at the moment," Bedlam says, "is all to the good of the Irish product." They (OTT) are Irish wrestling really, so if we can help in any way to produce guys locally to get to that level, I suppose that’s what our job is at Phoenix. We’ve already got a couple of guys on those shows. From the Phoenix wrestling and training school, if we can get those guys on our shows, getting exposure, gaining national exposure, get them, I suppose, politically in front of the right people, right, then they can make it to the next level, which is OTT and progress maybe across the water and beyond that level. What we want to do is get our people as much exposure as possible and up the ladder as quick as we can. If you look at the likes of Raven Creed, I think she is the hottest talent in Cork, one of the best wrestlers in the country. She’s already been on OTT Defiant, she’s going to be on the next OTT show, it’s only going to be a matter of time before she’s in the UK, who knows, WWE, NXT and so on. If we can start producing other people like that, Steve Savage or Ricky Combat, to get to that level, and use the Irish wrestling scene as a stepping stone to be able to progress themselves as independent wrestlers then that’s our job done. So who should we all be looking out for at Phoenix Wrestling shows? Flight Mode are really really good, they’re wrestling More Than Hype on our show. I think they're going to steal the show. We’ve already told the lads just go and do the wrestling. They’re certainly two guys who are going to be really big. I’ve mentioned Steve Savage, he’s pretty much ready to explode on the Irish scene. Aesthetically he looks great, a lot of tattoos, he's a good guy, dedicated, respectful, positive attitude, all the attributes to make a really good wrestler on the Irish scene. Of course we have Raven, who’s pretty much flying at the minute. And then we have Ricky Combat. Phoenix will be his renaissance, he was a top guy in CCW but didn’t really get the exposure he deserved. Maybe it was too early in his career, especially when he was CCW champion, bit too early. I think that Phoenix Wrestling is going to be great for him, get a bit more national exposure in a positive light, which I think would be really cool as well. In order to give them that exposure, Bedlam and Armstrong are going to try as many things as possible media-wise. All of their shows will be filmed, with content being made available on the Low Blows Network, which other promotions are already available on. They are on the verge of nailing down a short, weekly show on a radio station's YouTube channel, which has a reach of about 100,000 subscribers. They also plan on releasing regular shows and content on their own platforms too. With any luck this will get even more people into wrestling and coming to shows on a regular basis, even those who have never had an interest in it. A lot of people that go to wrestling for the first time are pleasantly surprised. People fundamentally always go away having had a good night. They go “oh, there’s Ballymun Bruiser there, he’s great craic” or they loved so-and-so’s entrance music, and these are just your casual fans. So I think why they should go is they’re going to have a great night; a bit of comedy, a bit of music, they’re going to have a great time at Phoenix shows. Wrestling is a very entertaining thing, and people who weren’t fans before, are now because of what it is at present. Our conversation coming to an end, I mention to Billy that at the rate pro-wrestling is growing in this country, it might be good timing for the GAA to open up Páirc Ui Chaoimh to accommodate them. If the budget stretches and we can get The Rock! You’ll be the first person I call and give you that exclusive. If I win the lotto and book The Rock vs Ricky Combat vs Luther Ward vs Devlin in a fourway in PUC, you’ll be the first person I talk to. You can buy tickets for Phoenix Wrestling's first show, here.